The above symptoms may also be common signs of magnesium deficiency. Adequate magnesium is essential for proper nerve function and is also associated with electrolyte imbalances that affect the nervous system. Low magnesium levels are also associated with personality changes and feelings of low self esteem. Magnesium is required by our cells for the production of energy, enzyme activity and a whole host of other essential functions. Magnesium ions also regulate over 300 biochemical reactions in the body and play a vital role in the reactions that generate and use ATP, the fundamental unit of energy within the body. Although magnesium is a highly calming mineral, it is also one of the first to be depleted in times of stress or pain. 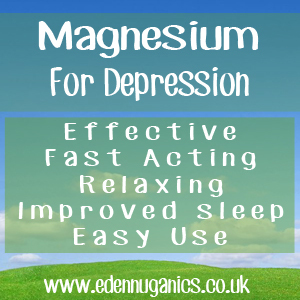 In fact, stress and tension increase the body's need for magnesium dramatically. Magnesium works to calm our muscles and relieve pain. When we think of stress, we often think of emotional stress, but certain foods, lack of sleep, over exercising and even loud noises can create stress on the body and cause magnesium levels to drop. St. John's Wort - The herb St. John's Wort (Hypericum perforatum) has a rich history of use in folk medicine. Often used in the treatment of sadness, worry, nervousness and poor sleep. There have now been a number of official studies that show St. John's Wort to be an effective treatment for mild to moderate depression. However, it may not be effective for severe cases and should not be mixed if you are using existing medications. Folic Acid - Sometimes known as folate, it is a B vitamin commonly found in green leafy vegetables as well as fruits, beans and some grains. Recent research indicates that people with depression who also have low levels of folate may not respond as well to antidepressants. By taking Folic acid in conjunction with prescribed antidepressants, it is possible to increase their effectiveness. You should consult your Doctor about this. 5-HTP - 5-HTP is produced by our bodies naturally and is used in the formation of the neurotransmitter serotonin. Taking 5-HTP in supplement form helps to boost the body's serotonin levels. However, 5-HTP should not be taken in combination with antidepressants.